Can you turn the light off for an evening (replace it temporarily for one night with a flashlight)? My Tablo is 6 feet away from our furnace without problems. Can you turn the light off for an evening (replace it temporarily for one night with a flashlight)? I may have neglected to mention above that I turned the light off before going to bed last night, and it’s been off ever since. So all the problems this morning were with that light off. Try moving the amp out of the basement and place it just before the Tablo in the same room as a test. Take the splitter out of the equation and have antenna go directly to amp to Tablo. Also remove the LTE filter for the time being - just for this test. So channels 19.1 and 19.2 are the ones I receive two each of, the primary broadcast from Cleveland and the repeater from Akron. Those Akron versions are the ones reported to be weaker than usual, but the cleveland ones registered as 5 dots. However, the guide refuses to show any programming for them. I can still watch 19.1 by clicking on the channel (it’s the NCAA tournament), but over the past hour it’s given me the “unknown error” three times. My wife permitted me to turn off the heat about 15 minutes ago, and it’s already buffered once briefly. I’ll leave things as-is for now, then make the recommended changes after dinner. The “unknown error” appeared again, so turning the heat off didn’t resolve anything. It dawned on me that in order to bypass the splitter and remove the amp from downstairs, I need two more female-female coax couplers than I have. I have just one, and it’s required for the power inserter (I was surprised that it was male on one end). Have you noticed any pattern when this happens - is it when a certain channel is on? The reason I ask is that I had one channel that caused me problems. My Tablo would freeze or drop recording for one channel (and it had 5 dots!). I had to fix the reception for it because it was affecting the other channels - in spite of the 5 dots it was unstable. For example if that problem channel was recording and also another one, this problem channel would screw up the good one being recorded by dropping the Tablo. I turned it off temporarily from the Tablo while working on its reception (using just the TV for it). When it appeared stable for hours, I restored it to the Tablo. Have you noticed any pattern when this happens - is it when a certain channel is on? No, there’s been no consistent pattern. Many of the errors I logged early on were channels 3 and 5 (NBC and ABC), which are my two strongest stations according to tvfool. However, those were just the two stations we watched more than the others, so I don’t think there’s a real correlation there. Every channel has failed at one time or another, oftentimes when no other channels are being recorded. One thing to make sure on the RCA preamp is that the VHF/UHF switch is set to COMMON. See PDF below. Also, if you are going to try the Tablo via WiFi to your router, move the Tablo all the way into the basement to make the shortest cable run possible. Antenna -> preamp -> power inserter -> Tablo. No splitter, no multiple different cables coupled together. Yep, it came already set correctly. Another test that could cost $30. I have a Homeworx DVR that is my backup. These cheap DVRs cost $30. Whenever I have Tablo problems, I look at the Homeworx to see if the same problem occurs on it. If so then I know its an environmental problem. If not then I know its a Tablo problem. The Homeworx is actually more stable than my Tablo and has better reception…for all of $30… (the iView is a variant of the Homeworx). It can be hooked up to a TV directly through HDMI. I had one station with a bad PID that the Tablo could not process but the Homeworx did. So I knew the problem was with the Tablo being unable to process that station. A box like this will help you see if the freeze affects only the Tablo(s). But it is $30. We shut the furnace off for the majority of last night and the problems persisted, so it seems that neither the fluorescent lights (off since Saturday night) nor heating are the problem. I’ve actually set up a return of the RCA amp and have ordered the Winegard LNA-200. It was pointed out to me that the Winegard claims to be less noisy. But there’s also a review of the RCA that states that a lot of them have defective power inserters. Given my observation of my signal strength taking a dive and that review, I think I’d rather work with the Winegard and continue troubleshooting from there. When we’ve had problems watching recordings, sometimes the problems occur in the same spots and we have to advance past those spots. These are assumed to be glitches in the recordings. Other times we get freezes/errors in one location, then it plays through that spot fine upon restart. Somebody pointed out that buffering or errors during playback of otherwise glitch-free recordings should be unrelated to anything between the antenna and RF input of the Tablo. Since my network should be plenty capable, it’s hypothesized that maybe the Tablo or Fire Sticks are busying themselves communicating with the Internet. I’m going to disconnect the router from the modem and see what happens during an evening of normal Live TV viewing. The LNA-200 is another preamp so again this really should go at the antenna mast to get the best performance out of it. Until then switching out preamps that are far away from the antenna seems counter productive. The Winegard HDA-200 is a great distribution amp which I would put just the Tablo (this is another device). I use the RCA preamp bad Winegard HDA-200 in combination and greatly improved my signal. I routinely pick up 54 channels, with all but 3 of those being 5 green dots. This is how I kept my sanity. 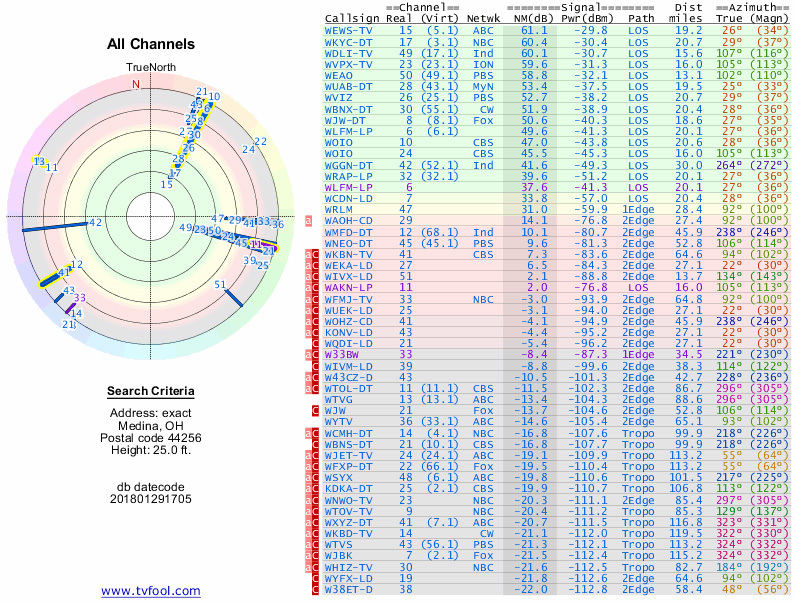 The Tablo reports 1 of my channels as consistently having green signal strength. However, it’s rare that it can actually tune in that channel. Weak signal message, extreme pixelation, or crash, and burn will occur. Drop the channels that cause problems, until you’re left with a stable system. Then add 1 at a time, and see what you can do to make it work better. If you can’t make it work with that channel, then forget about that channel. If I did that, I’d have no channels. These aren’t fringe signals that I’m trying to tune to and am getting errors with, they’re the strongest signals. 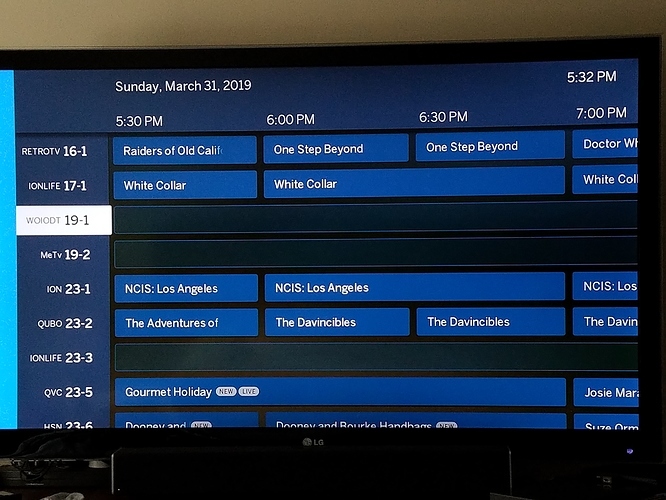 Channels 3 and 5 (NBC/ABC) included. The ones that I noticed lower signal strengths for (as reported by Tablo) with the new amp are the WOIO/CBS real channel 24 (Akron), which is just a repeater of real channel 10 out of Cleveland. The Akron signal went from 5 dots to 3 dots. The “fringe” signal historically is WMFD channels 68.1, 68.2, 68.3, which I don’t even watch. It used to be 3 dots and is now 1 dot. You have 2 main set of channels that are pretty much 90 degrees apart as well. Based on your photos you have a directional OTA antenna. Maybe try pointing it only towards one market, it would likely improve the signal as well. Of course at the detriment of the other market. 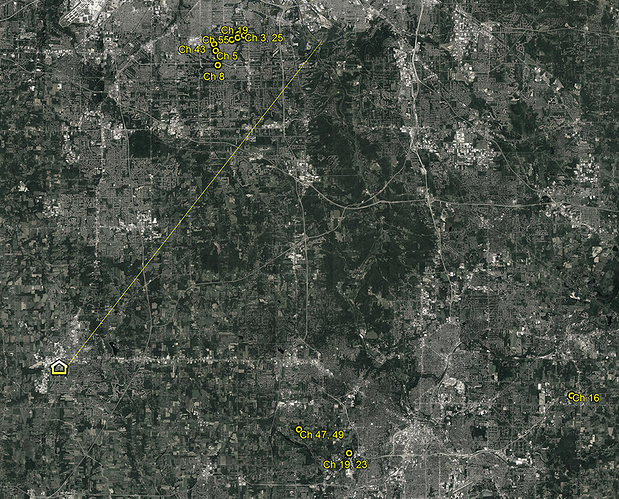 It is pointed pretty much towards the Cleveland transmitters and is pulling in Akron off the side. Ideally at those signal levels you wouldn’t need a preamp. Have you tried without any amp? I installed an antenna for someone with similar distances and signal levels and no amp was needed. Yes, when I first posted it was surmised that my signals were suddenly too strong (because of the loss of foliage), so I played with different combinations of simply removing the amp and then also adding various magnitudes of attenuation. I determined that I could add 23 dB of attenuation (in addition to removing the 15 dB amp) before any of the strongest stations started to drop below 5 green dots. I ended up leaving 18 dB attenuation on the line (to save the PBS signal out of Akron I covet), along with bypassing the amp, and the problems persisted. I removed the attenuators but left the amp bypassed for a while, then just went back to my original setup with the amp engaged to pursue other avenues of troubleshooting. EDIT: This thorough test is what leaves me pondering how Tablo Support is identifying evidence in the logs of weak signals being the cause of many of my errors. I’ve been operating at full strength – 15 dB amp engaged and MINUS any of those attenuators for a couple of months at least, certainly the entirety of the time that Support has been monitoring my logs.